Epiphany Parish's Service Ministries are opportunities through which members serve parish needs or the special needs of individuals and families. The Bereavement Ministry is a special outreach to console and support individuals who are mourning the death of a loved one. Contact Bereavement@EpiphanyParish.com for support or to volunteer. The Bereavement Ministry also sponsors GriefShare. GriefShare seminars and support groups are led by people who understand what you are going though and want to help. You'll gain access to valuable GriefShare resources to help you recover from your loss and look forward to rebuilding your life. The Bereavement Ministry also plans a special Remembrance Mass for recently deceased members of the parish each November on All Souls Day. Contact our coordinator for more information or to volunteer. The Building & Grounds Committee consists of parishioners who are experienced in professions that help with the maintenance of the church, school, convent, rectory, and grounds. If you are interested in serving the parish as a volunteer, please contact Fr. Eric. The Education Commission assists the pastor with regard to catechesis and preparation for sacraments at Epiphany School, to discern formation needs, and to advise the pastor regarding policies and programs to meet those needs. Annually in the spring, parish elections fill the vacancies left by two departing members. Those interested need to be active and supporting members of the parish. Contact Fr. Eric if you wish to be a candidate for service. For more information about the school, see the Epiphany School Website. The mission of Elizabeth Ministry is to respect all life, cherish children, encourage families, enrich marriages and build community. Current areas of ministry at Epiphany Parish include pregnancy and celebration of birth; infertility and adoption; miscarriage, stillbirth, and child death; special needs; and family crisis such as hospitalization. We provide practical support such as meals and gifts to baptized children, social support through visits with those who share similar experiences, and spiritual support through prayer. To get involved email the coordinators . For women who would like to request the services of the Elizabeth Ministry, please contact a coordinator. We will match you with an Elizabeth Minister who has lived a similar experience. For women who want to become Elizabeth Ministers, there is a one-hour training required before ministering. We gather at 7:00 p.m. on the third Monday of each month (except July and December) in the Cenacle Room at the church. Attendance is not required to minister. See also Elizabeth Ministry International. Faith in Action is a non-profit organization that serves seniors age 60 and older with basic needs, such as transportation to doctors, grocery stores, and other necessary errands; friendly visiting; and minor home maintenance chores. Services are free and provided by volunteers from a coalition of churches, including Epiphany Church and other community members. Services are provided in the Bloomington-Normal, Towanda, and Heyworth areas. Individuals wishing to volunteer attend a training meeting. Volunteers who transport can choose their client on an internet-based program called Ride Scheduler. There are no minimum hours of service and volunteers can even serve seasonally, when they are available. Seniors 60 and older desiring service must call the office at (309) 827-7780 to request service from Faith in Action. An in-home visit will be scheduled by one of the visiting assessment nurses who explains the program. A person must be registered with Faith in Action in order to receive any services. There are no fees and no income qualifications. Faith in Action is located at 705 E. Lincoln, Suite 110, Normal, IL 61761. Those seeking services or to volunteer, please contact Sandy Holcomb or Jackie Beer. Those seeking to volunteer should also visit the local Faith in Action website. The Parish Finance Council is mandated by church law: "In each parish there is to be a finance council to help the parish priest in the administration of the goods of the parish." The principal function of the council is to promote adequate parish revenue for the services and activities of the parish. Every year in the spring elections are held to replace that member leaving the council at the end of their term. Candidates should be well versed in financial matters and need to be active and supporting members of the parish. If interested in running for office, please contact Fr. Eric. As a service to the bereaved, the Funeral Committee organizes and staffs a luncheon at the parish following burial. Please contact the parish office so we may serve you in your time of loss. Volunteers are needed to serve th3e meal and prepare desserts for the event. Please contact Maggie Vaselack at 452-1886 or contact the parish office 452-2585. Meet your Epiphany family! Building community and fostering friendships is central to becoming a vibrant parish! At our weekly "Coffee & Donuts" in the Parish Hall you'll find donuts, hot oatmeal & toppings, fresh coffee, and chilled juices following the 7:30 & 9:00 am Sunday Masses. Specialty croissants are served in the Narthex after the 4:00 pm Saturday mass, and again after the 11:30 am and 5:30 pm Sunday Masses. These tasty treats can all be enjoyed by Epiphany parishioners and guests who are welcomed and served by the Hospitality Ministry volunteers. This is an opportunity to become friends with other Epiphany parishioners. More volunteers are always welcome to join this worthwhile ministry! Won't you please consider joining us? Please contact Karen Bordewickwith questions and/or to sign-up. At Council #6498 in Normal, IL, you will find brother Knights working to fulfill the central mission of the Order: striving in charitable works, serving the Church and unified in following its teachings, supporting brother Knights in their temporal and spiritual needs, acting for the good of their country, and giving aid to widows, orphans, the sick and the poor. Membership in the Knights of Columbus is open to practical Catholic men in union with the Holy See and who are at least 18 years old. A practical Catholic is one who lives the Commandments of God and the Precepts of the Church. The Knights of Columbus Normal Council 6498 meets the first and third Tuesday's at 6:00 pm in the Epiphany Parish Hall. Please also visit the web site of Knights of Columbus Normal Council 6498, and see the national web site of the Knights of Columbus. Epiphany offers multiple Natural Family Planning options for married and engaged couples as well as single interested women. Each series of classes meets Sunday afternoons in the Cenacle Room once a month for three consecutive months. The sympto-thermal method teaches couples to understand the three main signs that show when women are fertile and infertile and empowers couples to be able to apply the method correctly to help achieve or avoid a pregnancy. Volunteer teaching couples remain in contact with former students to help with any cycle issues that arise and to direct them toward the right interventions if needed. The classes cost $130 and include a year's membership to CCL, all class materials, and access to fertility aps and online magazines to support the cause. If cost is an issue, there are scholarships available so don't hesitate to ask! To register, go to ccli.org, and for more information, contact Matthew and Michelle Koetters at mkoetters@yahoo.comor Bobby and Elizabeth Rariden at liz.rariden@gmail.com. The Creighton Model FertilityCare System is method of fertility awareness that can be used by married couples to avoid or achieve pregnancy and by any woman, married or single, to monitor her gynecological health. As a woman learns to chart her cycle using the Creighton Model, NaPro Technology (Natural Procreative Technology), provides treatments to address gynecological issues and the underlying causes of infertility. The Creighton Model FertilityCare System can be used to promote health before, during and after pregnancy, while breastfeeding, and in the time leading up to menopause. In addition, it allows specially-trained medical professionals to diagnose and treat the underlying cause of conditions such as ovarian cysts, unusual bleeding, painful periods, polycystic ovaries, endometriosis, recurrent miscarriage and infertility. Call or email Erica Miller to schedule the introductory session on an individual basis. Following the introductory session, the couple or single woman will attend regular follow-up sessions to ensure learning and monitoring of her cycle. Contact Erica Miller at erica.l.miller2@osfhealthcare.org for more information. Epiphany Parish Prayer Chain is a group of parishioners who love their neighbor in time of need through prayer. All are welcome to join and become a prayer warrior for their fellow parishioners. There are no meetings. When prayer is needed, the request is passed on to the Prayer Chain members by email (or phone if necessary) and remains anonymous. To request prayer for your personal intention or to join the chain, contact the Prayer Chain. 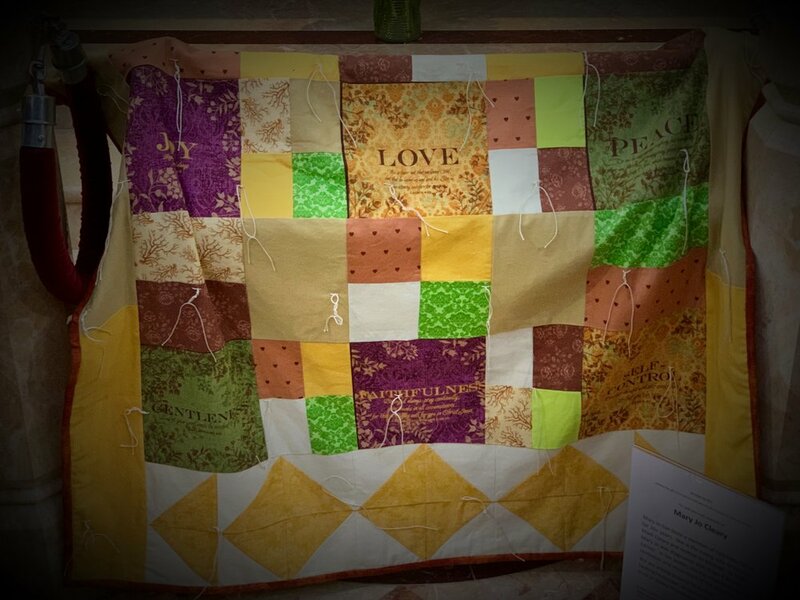 The idea behind these quilts is simple, but powerful. A heavy thread is used to secure the quilt layers and the ends are left free to be tied with a square knot. As each knot is tied, a silent prayer is offered for the person who will be receiving the quilt. The quilt is then given to the recipient. What makes each quilt special is not the pattern, color, or workmanship, but the fact that prayer is symbolically tied into each one. These comforters are a statement of faith, and a testimony to our belief in God and in the power of prayer. Each quilt will be blessed during the masses after the knots have been tied. Quilts will be displayed in the Narthex and Adoration Chapel for one or two weeks prior to the blessing so that everyone has an opportunity to tie a knot and offer a prayer. If you have questions about our new Prayer Quilt Ministry, please email the Prayer Quilt ministry lead. There are many opportunities to support this new ministry even if you don’t sew! Watch for more information coming in the bulletin. The mission of the Epiphany Sanctity of Life Committee is to promote respect for human life from conception until natural death through education, prayer and service. Holy Hours for Life offered in January, July and October. Monthly Mass offered for Respect for Human Life. Articles and information pertaining to life issues submitted to the bulletin. Information about state and federallife-issue legislation sent to parishioners who have signed up to receive these alerts. Occasionally the committee sponsors speakers to come to the parish and talk about pro-life subjects. Observance of National Day of Remembrance for Aborted Children at Holy Cross Cemetery Memorial for the unborn. Attendance at the diocesan pro-life meeting. Contact Amy Christensen to get involved or to be placed on our legislative alert email tree. Non-perishable food items are collected each Sunday and delivered to the St. Vincent de Paul food pantry in Bloomington. Contact Maggie Veselack at 452-1886 for more information.